AskMe delivers business-ready Knowledge Discovery Tools on top of a Knowledge Management and Business Process Management Foundation. With the aid of both standard and customizable forms, collaborative outputs can be captured through knowledge publishing options. Provides continuous knowledge capital refinement through tools that provide feedback, rate the value, and mark obsolete specific responses. AskMe layers business-ready knowledge discovery tools on top of a solid foundation of knowledge and business process management to build an organization's most strategic asset – knowledge capital. Harness your knowledge capital and innovate faster, reduce costs and improve customer satisfaction. We are on KMWorld's 2012 list! 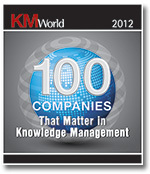 Seattle – February 28, 2012 – Hivemine, a leading provider of solutions that manage and build long-term knowledge capital, announced today that it has been named to KMWorld's 2012 list of "100 Companies That Matter in Knowledge Management." Compiled by KM practitioners, theorists, analysts, vendors, their customers, and their colleagues, the list will be published at www.kmworld.com and in KMWorld Magazine in early March. Hivemine's AskMe combines the structure and process of traditional knowledge management solutions with the engagement benefits of social business software. AskMe connects people and mines their social interactions and content for nuggets of information. These nuggets are transformed into knowledge capital that can be used by anyone in an organization. The knowledge capital created through AskMe helps companies boost innovation, avoid costly duplication of effort, make better decisions and minimize the effects of "brain drain." 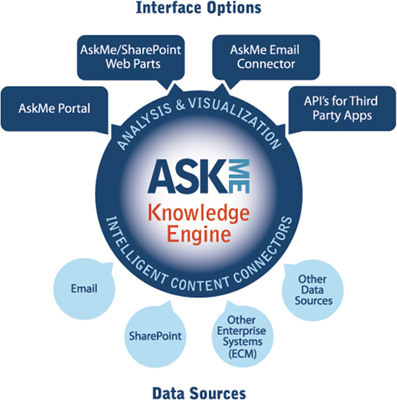 AskMe can be used as a standalone knowledge management solution complete with social tools, or layered on top of collaboration platforms like Microsoft® SharePoint® or enterprise social networking tools. According to KMWorld editor in chief Hugh McKellar, the companies on the 2012 list have "demonstrated an unwavering commitment to their customers by helping to harvest an organization's collective intelligence in order to best serve its entire constituency chain." The recognition by KMWorld is a milestone for Hivemine, which acquired the AskMe solution and existing AskMe customers from Realcom U.S. in mid-2011. "This is the 5th year that AskMe has been acknowledged by KMWorld," stated David Wachter, Hivemine's chief marketing officer. "It reflects the continued evolution of AskMe as an industry-leading KM solution and recognizes Hivemine's strategy for building knowledge as a by-product of how people work and delivering information via familiar applications like SharePoint." 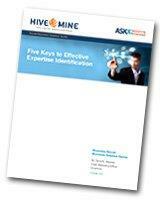 To learn how AskMe has helped Fortune 500 companies build their knowledge capital in complex enterprise environments, visit http://hivemine.com. Copyright © 2019 Hivemine. All rights reserved.